It's that time of year when hopeful undergrads send out their resumes to the investment banks they for some reason want to work for. But one guy's bombastic cover letter has made him the laughing-stock of Wall Street. 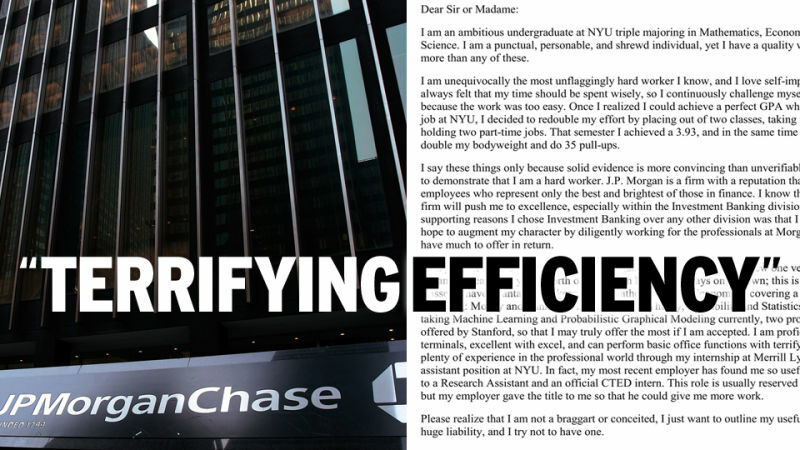 A tipster forwarded us this cover letter, from an NYU student named Mark to J.P. Morgan, with the note, "this has been circling around the Street." Marvel at how a single fitness boast transforms what would have been simply a very terrible cover letter to something demanding to be forwarded to everyone on your contacts list. I am an ambitious undergraduate at NYU triple majoring in Mathematics, Economics, and Computer Science. I am a punctual, personable, and shrewd individual, yet I have a quality which I pride myself on more than any of these. I am unequivocally the most unflaggingly hard worker I know, and I love self-improvement. I have always felt that my time should be spent wisely, so I continuously challenge myself; I left Villanova because the work was too easy. Once I realized I could achieve a perfect GPA while holding a part-time job at NYU, I decided to redouble my effort by placing out of two classes, taking two honors classes, and holding two part-time jobs. That semester I achieved a 3.93, and in the same time I managed to bench double my bodyweight and do 35 pull-ups. I say these things only because solid evidence is more convincing than unverifiable statements, and I want to demonstrate that I am a hard worker. J.P. Morgan is a firm with a reputation that precedes itself and employees who represent only the best and rightest in finance. I know that the employees in this firm will push me to excellence, especially within the Investment Banking division. In fact, one of the supporting reasons I chose Investment Banking over any other division was that I know it is difficult. I hope to augment my character by diligently working for the professionals at Morgan Stanley, and I feel I have much to offer in return. I am proficient in several programming languages, and I can pick up a new one very quickly. For instance, I learned a years worth of Java from NYU in 27 days on my own; this is how I placed out of two including: Money and Banking, Analysis, Game Theory, Probability and Statistics. 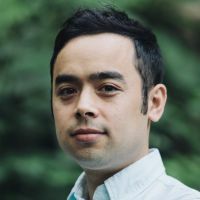 Even further, I am taking Machine Learning and Probabilistic Graphical Modeling currently, two programming courses offered by Stanford, so that I may truly offer the most if I am accepted. I am proficient with Bloomberg terminals, excellent with excel, and can perform basic office functions with terrifying efficiency. I have plenty of experience in the professional world through my internship at Merrill Lynch, and my research assistant position at NYU. In fact, my most recent employer has found me so useful that he promoted me to a Research Assistant and an official CTED intern. This role is usually reserved for Masters students, but my employer gave the title to me so that he could give me more work. Please realize that I am not a braggart or conceited, I just want to outline my usefulness. Egos can be a huge liability, and I try not to have one. Thank you so much for your time, and I look forward to hearing from you. The endless email thread forwarded to us suggests every investment banker on Wall Street has seen this thing, much like the classic Aleksey Vayner video resume. Here are a few of the comments appended as the email bounced from Merrill Lynch, to BNY Mellon, to Barclay's, etc. Drinks on me for the first analyst to concisely summarize everything that is wrong with this. This is sensational. This guy has already interviewed everywhere and has been nowhere. please enjoy. someone find him on facebook (although at this point, he probably deleted it). be sure to scroll through the list of companies that this has been through in 5 days. this kid is never getting a job. When reached by phone yesterday, Mark was well aware of the furor surrounding his letter, and that he'd overplayed his hand. When asked if he'd gotten a job at J.P. Morgan, he laughed. "No, not at all. Didn't you see my letter?" Cheer up, Mark. You don't really want to be an investment banker, anyway. Those guys are all total dickwads.